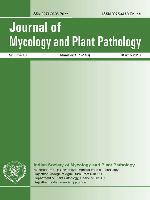 The Journal of Mycology and Plant Pathology welcomes original research papers on fundamental or applied aspects of mycology and plant pathology, short communications, new records, mini reviews, letters to the editor on relevant issues and book reviews. All manuscripts be written in English in double-line space. Manuscripts for a Full Length Paper should not normally exceed 20 pages, a Short Communication 6 pages and a Mini Review 20-25 pages, including tables and figures. Letters to the editor and book reviews should be brief and well focused, not more than a page. All authors of a manuscript must be members of ISMPP. A certificate of agreement signed by all coauthors must be included to verify that they have been involved in planning and conduct of experiments, and preparation of the manuscript, and they agree with the content. Title. It should be short and informative; do not include names of authors of taxa, and higher taxonomic categories and capitalize the first letter of each proper noun. It should be in bold letters. Authors and their affiliation. Just below the title include author(s) name(s) in bold and their affiliations in italics. Include e-mail of the corresponding author. Abstract. It should be of about 200 words in a single paragraph; include objective, brief experimental methods and major research findings. Key words. Just below the abstract provide 5-6 key words in alphabetical order to supplement the title. These are used for abstracting and indexing the article. Citation. Include a reference citation of the paper as normally done in Journal of Mycology and Plant Pathology (J Mycol Pl Pathol). Heading. Primary headings should begin at the left margin. Usual primary headings are Materials and Methods, Results, Discussion or combined as Results and Discussion, Acknowledgement and References. Introduction. Heading for introduction is not required. This should include brief statements on the research problem, brief review of relevant literature and the objectives of the research. Material and Methods. Clearly and briefly mention all the materials, such as plant, seed, pesticides, chemicals, isolates and equipments and their sources used in the study. There is no need to describe in detail the well-known methods/protocols, simply cite the references. Describe the details only if a new method has been developed in the study. Provide details of experimental designs, data collection, and methods and tools used in data analysis. For clarity, describe each method under specific subhead. Results. Briefly describe the results by referring to relevant tables and figures; clearly indicate treatments showing significantly superior results; do not elaborate non-significant results; do not repeat methodology; do not discuss or speculate any implications. Present results under subheads for better clarity, if needed. Discussion. This section should focus discussing major findings of the study and their implications in furthering knowledge and applications; how the results will contribute to enhance the effectiveness of a disease management practice, increase productivity and benefit growers, simplify the existing methods, development of a new method etc. Discuss and analyze the findings in relation to the stated objectives of the study, compare and contrast with available findings in literature and indicate any shortcomings, and future research needs. Results and Discussion. In some cases, when the research problem is new and available literature is limited, Results and Discussion can be combined. Present results along with discussion under specific subheads in an orderly way and make a brief conclusion. Papers on routine activities, such as screening germplasm/breeding lines for disease resistance in the field and in vitro seed germination, inhibition tests or nutritional studies on pathogens will not be accepted. Scientific names. Italicize all generic names as commonly practiced for all scientific publications. Citation of nomenclatural authorities is useful at the first citation in the text, table and figure. Tables. Make simple data tables with minimum rows and columns to fit on a page in portrait format. If numerical data sets are too small to construct a table they can be better described in the text. For each data set, units of measurement should be clearly mentioned. Certain data sets require transformation to bring homogeneity, such as arcsin for percentage data, before statistical analysis. Check with your statistician/biometrician if the data sets require transformation. Numerical data results must be appropriately supported by proper statistical analysis. Levels of statistical significance (LSD/CD) that can be mentioned without further explanation are * = P<0.05, ** = P<00l or *** = P<0.001. Illustrations. Designate all illustrations - photographs, graphs and line drawings as figures and number them consecutively. A plate of drawings or photographs may be treated as one figure with letters for each element or as several figures with each figure numbered consecutively. Provide figure legends consecutively, in a paragraph just after References. Figures should be designed properly to fit in single column (8.0 cm) or two columns (16.5 cm) width by 22.8 cm height. References. All references cited in the text must be included under References. Make sure that the spelling of author's name and dates are correct both in the text and in the Reference list. Several references cited together in the text should be arranged chronologically. Publications by the same author(s) in the same year should be listed as 2012a, 2012b etc. References must be cited in the text as (Sharma 2009; Mathur and Yadav 2011; Thomas et al 2010), or Reddy (2008), Bhale and Verma (2010), Pandey et al (2011). Refer the latest issue of J Mycol Pl Pathol for further details. Use the following system for arranging your references. root rot of chickpea caused by Macrophomina phaseolina. J Mycol Pl Pathol 38: 580-587. Aggarwal R, Sharma V, Kharbikar L L and Renu. 2008. Molecular characterization of Chaetiminum spp. using URP-PCR. Gen Mol Bio 31: 943-946. Workshop on Pigeonpea. Vol 2, 15-19 Dec 1980, Int Crop Res Inst for Semiarid Tropics (ICRISAT), Patancheru, Hyderabad, India, pp 173-177. Rice Conf. 5-7 Nov 2004. Tsukuba hit Cong Ctr, Tsukuba, lbaraki, Japan, p361 (Abs). Pathak V N. 1980. Diseases of Fruit Crops. Oxford & IBH Publishing Company, New Delhi. 309pp. II, Baghlingampally, Hyderabad 500 044. 247pp. and Publishers, New Delhi. 798pp. Fischer Verlag Stuttgart. New York. 159pp. Rao, C Manoharachary, DJ Bhat, RC Rajak and TN Lakhanpal (Eds). International Book Distributing, Lucknow, India. 906pp. and Vainganga valley of central India. J Mycol Pl Pathol 34:972 (Abs). Binimol KS. 2000. Integrated management of Phytophthora rot in black pepper nursery. M Sc (Ag.) Thesis. Kerala Agricultural University, Thrissur, India. 105 pp. Describe briefly the topic of investigation, materials and methods, results and discussion in different paragraphs without any headings/subheadings. Results must be appropriately supported by data tables and figures as required. Acknowledgement and references must be cited in text as done in a full paper. Keep references to the minimum. The total length should not exceed 6 pages. Reports on new records of known pathogens will be accepted only when the crop is attacked by a pathogen for the first time in the country, but not in a state or a district. Wherever a new genus or species of pathogen is being reported, the authority for identification and the 1M1, HCIO. 1TCC, etc. for the type collection should be indicated. The report should be appropriately supported by tables, figures and references as required. a.i. = active ingredient; ac = acre; avg = average; bp = base pair; cfu = colony forming units; cm= centimeter; cv. = cultivar; d = day; diam =diameter; Eq = equation; Exp = experiment; Fig = figure; g = gram; h = hour; ha= hectare; kg = kilogram; L = litre; m = meter; M = molar; mo = month; min = minute; nm = nanometer; no = number; ppb = parts per billion; q = quintal; rpm = revolutions per min; RH = relative humidity; s = second; sp., spp. = species (only after a genus); t = tone; temp = temperature; vs = versus; wk = week; yr = year; % = percentage. For further details refer to the latest issue of Journal of Mycology and Plant Pathology.